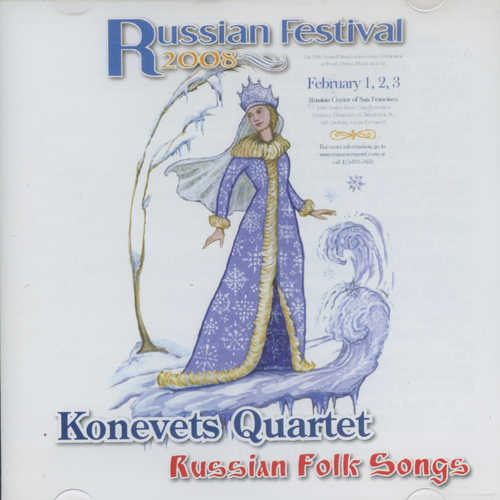 A photo of Alexander, Sergey, Igor and Boris, the four very manly-looking Russian men, dressed in matching black, shiny Russian dress shirts, who form the Konevets quartet graces the back page of the liner notes for "Russian Festival 2008." On the cover is an illustration of a beautiful Russian snow princess. Inside is the two page songlist, with brief descriptions of what the songs are about, for instance, "Through the endless plain:" A young recruit, far away from home and his beloved, sings of his hard fate. Soldiers in the Tsar's army served for 25 years. Some other favorites are the Russian Naval hymn from 1905, "The Cruiser Varyag," "The young girl walked in the furrows," the Christmas tunes "Carol of the Bells" and "The night is silent over Palestine;" "Ballad of Prince Oleg," the cossack's song "It's good, brothers, to be alive!," "Snowstorm," the brigands' campfire song "Rise o red sun," "Through the unknown Taiga," the comic song "Tula, my home" and the folk song "Evening bells." Wonderful deep-voiced harmonies and deeply-felt emotions from this powerful, veteran Russian quartet!